My dentist told me that I am not a candidate for porcelain veneers because my top teeth almost completely cover my bottom teeth. Instead, he wants to put 6 porcelain crowns on my top front teeth. 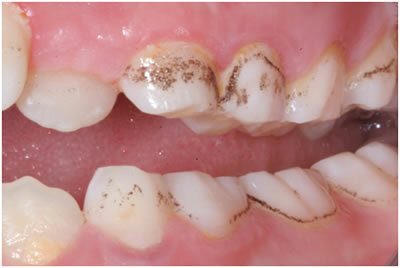 I want a beautiful set of teeth, and unfortunately mine are stained from tetracycline. I have 2 questions: 1) Have you heard of veneers being inappropriate for a particular bite such as mine? And 2) Since my bottom teeth will not be crowned, is it reasonable to expect that I can bleach them to match my new crowns on top? Oh no, you don’t want to do crowns on all your front top teeth! To do that they’ll all have to be ground down to stubs. And you don’t need that. Having a deep overbite the way you do it actually makes more sense to do porcelain veneers, because nothing has to be done to the backs of the teeth—all the work is confined to the front. This happens with cosmetic dentistry a lot. You want a cosmetic treatment. Your dentist doesn’t do a lot of cosmetic dentistry and doesn’t feel comfortable with the particular procedure you want, so he or she gives you some excuse why this isn’t appropriate for you. I’ll give your dentist credit for creativity at least—this is the first time I’ve heard of a particular bite being a reason for not doing porcelain veneers. Furthermore, you have tetracycline stains. This is one of the most difficult smile makeover situations there is, and you don’t want to have your family dentist doing this. It requires a high level of expertise and a lot of experience with cosmetic dentistry. And six teeth? People show eight to twelve upper teeth when they smile, depending on the width of your smile. Doing just six teeth when you have tetracycline stains would look really funny. This is another signal your dentist is giving that he is in over his head on this. Sorry to be so blunt about it, but I’m trying to look out for your best interests. My recommendation: Go to one of our expert cosmetic dentists that we recommend. We have several in Louisiana who could do a great job for you and give you a beautiful smile. There is one close to you that I will email to you privately, so I don’t give any clues as to your exact location. If you otherwise like your dentist, explain what you are doing and that you’ll be back to him for your regular checkups, cleanings, and other work, but that you’ve been advised that this is a difficult cosmetic procedure for which you need a cosmetic specialist. About bleaching your lower teeth—this is an option, depending on the type of bleaching and the severity of the tetracycline stains. This is another reason you want an expert who has experience with your type of case. The Kör deep bleaching system can give some pretty decent results with these stains. I have received various answers on retouching my bleached teeth with Opalescence PF used with trays. I want to do this before deciding on the color for crowns. I used 20%. How long should I touch-up (for example, 1 week, 2 weeks)? How many hours each day (1 hr., 2 hours, or 3 hours)? Is it necessary to stop whitening a certain length of time before appointment (not necessary, 1 week, 2 weeks)? There is no real fixed answer on how long you should touch up with Opalescence 20% PF or any other brand of bleaching gel, and I’m concerned if you’re having these crowns done by a dentist who can’t answer these questions for you. I would have to see your teeth, know a little of the history, and know how white you want them. Is this really the dentist you want giving you a new smile? Is this a dentist with an engineering mentality who has little passion for appearance-related dentistry and who will leave you with a well-fitting smile that looks very mediocre – kind of like the photo on our home page? Or is your dentist a true artist, one of the 1-2% minority of dentists who will actually give you a beautiful smile? Here’s the deal on teeth whitening and how much to do it. No one has found a real limit on how much you can whiten your teeth. The longer you whiten, the whiter they get. The pace of whitening slows the more you do it, but the teeth keep getting whiter. So if you were my patient and had questions like this, I would ask questions like how satisfied you are with the current color, how much you bleached them before, have the teeth darkened much since you first had them whitened, and then how much work you are willing to go through to get them to what you would consider to be their ideal whiteness. And the amount of time each day you should whiten depends on whether or not you are getting sensitivity from the bleaching gel. Do them as long as you can, is the bottom line, as long as you’re not having any sensitivity. Now if you are sleeping, your saliva flow goes way down and the bleaching gel will stay in the trays much longer. One application should last through the night. You don’t need a gel that is specifically designed for nighttime use – they all contain peroxide. During the day, depending on how tightly your trays fit, saliva will get into the trays and wash out the gel, and you’ll need to keep replenishing it. You do need a minimum period of 20-30 minutes for the gel to soak into the tooth. Beyond that, the more the better. The one fixed answer that I can give you is how long to stop whitening before any color-matching is done on the new crowns. The whitening is accomplished by the peroxide gel releasing tiny bubbles of pure oxygen within your tooth, and the oxygen oxidizes the stains and darker colors. Once you’ve completed the bleaching, you need to give time for those little oxygen bubbles to disperse in order to get a true color for the teeth, and that takes a couple of weeks. Now if you are doing eight front teeth, the color of the back teeth and the lower teeth doesn’t need to really match – it just needs to be close – and a week would be enough time to wait. But if you need an exact color match of a front tooth with a crown matched to another front tooth with natural enamel, you need to wait the full two weeks. So what I’ve answered goes beyond simple teeth whitening touch-up. Once your teeth are whitened to the degree you want, then there is a certain amount of teeth whitening relapse that you will have, as the teeth pick up stains from your food – coffee, tea, berries, fruit juices, etc. But whitening for two or three days maybe an hour a day and doing that once every year or two should take care of that and enable you to maintain that bright white bleached color. But again, I’m quite worried about what kind of work is going to be done on you. An excellent cosmetic dentist would have brought up this subject with you when the case was treatment-planned and would have covered all these points. Do NOT rely on the claims of a dentist about being a cosmetic dentist, or advertising. The problem with the dentists who don’t do very good appearance-related dentistry is that they aren’t artistically inclined and they are blind to their own shortcomings in this area. Dentists with strong academic credentials, dentists who are prosthodontic specialists, and dentists with “high standing” among other dentists can be particularly problematic. They may do highly functional, long-lasting dentistry with absolutely no artistic taste. Be careful. Link: Click here to read our page about the home teeth bleaching procedure. Bleach Your Teeth with Clorox? “Can I bleach my teeth with regular bleach? He had thirteen answers from sensible people who responded with varying levels of horror. I have a rather different take on this question, colored by my experience as a cosmetic dentist. It was maybe about 25 years ago, before teeth bleaching was widely practiced, that I had a patient who told me that she gargled with Clorox to help keep her teeth white. She was a young woman, and I have to admit that she had nice, white teeth. But I told her that I didn’t think that was smart. Clorox isn’t an acid, it’s a base, kind of like lye. And it’s corrosive and can burn living tissue. Plus, contact with certain other chemicals can cause it to release chlorine, which is a toxic gas that will kill you. But interestingly, it’s probably a majority of dentists who use Clorox or another brand of household bleach in doing root canal treatments. The active ingredient is sodium hypochlorite, which is an excellent cleanser to use inside a tooth root for dissolving away all the dead organic debris inside a cleaned-out root, and for disinfecting the tooth. They taught us this technique in dental school. But don’t gargle with it. So there you go. That’s the official word. There is also a notice on the label: “It is a violation of federal law to use this product in a manner inconsistent with its labeling.” So beware. In addition to poisoning yourself, someone may sic the bleaching police on you. It would be a bad scene all around. Just don’t go there. Can I whiten my dental bonding? I have bonding on my two front teeth. The bonding is about 14 years old and should be replaced but I dont have the money at the moment. I understand that bonding doesnt change color with bleaching. My questions is can I atleast bleach the bonding back to its orginal color? Will the white strips change the color at all? No teeth bleaching will get your dental bonding any whiter. It will only make it look worse because it will whiten your natural teeth and won’t affect the color of the bonding. It’s possible that the bonding could be made to look better with a little polishing. If the discoloration of the bonding is from external stains and is not internal to the bonding material, it’s possible that the discoloration could be polished away by an expert cosmetic dentist. Otherwise, it would have to be replaced. If you’re short of money, it would be smart to wait. Don’t go looking for bargains in cosmetic dentistry, especially with dental bonding. It requires artistic talent to do that right, and most dentists don’t even have the materials on hand to do that right. We list several excellent cosmetic dentists in the Philadelphia area, and I would go to one of them if it matters to you how this looks.